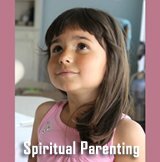 What is spiritual parenting? Well, first of all, it's just a term really. It's just something pointing in a certain direction. 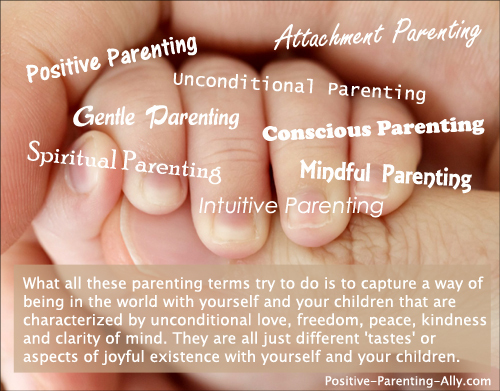 I could just as well have called it conscious parenting, mindful parenting, unconditional parenting, positive parenting, attachment parenting, gentle parenting, intuitive parenting etc. What all these parenting terms try to do is to capture a way of being in the world with yourself and your children that is characterized by unconditional love, freedom, peace, kindness and clarity of mind. They are all just different 'tastes' or aspects of a joyful existence with yourself and your children. But if I were to be more precise as to how I view spiritual parenting, I think maybe I will start by taking a look at the term 'spiritual' which may mean a lot of different things for different people. The way that I see it, spiritual parenting is not about about teaching children something 'external' like a certain belief system or dogma. 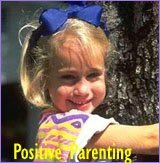 On the contrary, spiritual parenting is about helping children stay centered within themselves and helping them realize that everything points back to themselves. That they are he place where everything begins and everything ends. 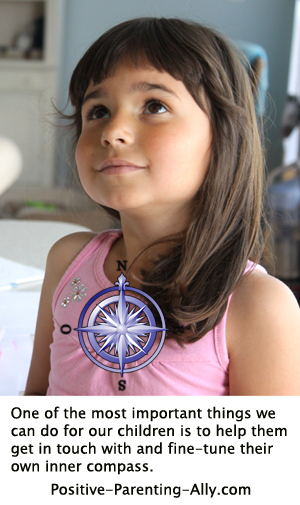 Spiritual parenting supports the idea that there really are no objective rules in the world - that the best position from which children can make sense of the world is through checking in with their own inner compass: Does what I'm doing feel right, or doesn't it feel right? Nothing else matters! I'm fully aware that such a way of parenting may sound very radical, idealistic or perhaps even naive for many people. Surely children need rules and beliefs in order to feel safe and secure? I would tend to say both 'yes' and 'no' to answer that question! Sorry, for being so unclear. 'Yes' children need answers but the question is where to reap those insights. Do we feed them external ideas made up by norms of society or various institutions of authority or do we encourage self generated answers? There is no doubt as to which way seem the easiest ... at least short term. However, if you decide on the route of self discovery for your children, I sincerely believe that you will help them enormously not only when growing up, but also as adults. If children are allowed to fully discover who they are (and being accepted in the process of that) the likelihood of a happier, more conscious way of living is much higher. At least that is my experience. Thus for me, spiritual parenting is being available for my child to help him continuously become more and more conscious of what he feels is right for him. In my experience, self consciousness is a pretty powerful main ingredient in the recipe for a long term happier and not to forget, easier life. So What Are Our Roles as Parents? - To Be Our Own Best Friend and Help Ourselves First! ... only then can we truly be there for our children. What I've learned during the years is that I can't really help anybody ... not even my son ... if I haven't helped myself first. Because what I am, is what I give to the world. Am I love, I give love! Am I frustrated and confused, I give frustration and confusion! It just seems to work that way. It's really very simple. 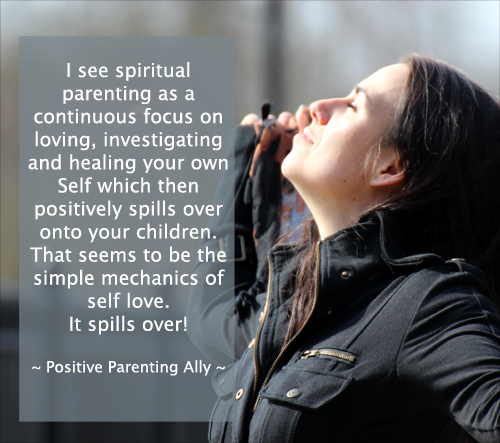 I see spiritual parenting as a continuous focus on loving, investigating and healing your own Self which then positively spills over onto your children. That seems to be the simple mechanics of self love. It spills over! Thus when parents learn to really know themselves and love themselves, they cannot help tuning into and unconditionally loving their children. It's a natural and wonderful byproduct of being self conscious and at peace. And when parents display unconditional love toward their children, the children learn that they are love too. 1) You as a parent do your best to really get to know yourself on as many levels as you can. Self investigation can be terrifying work as you might discover that everything you believed about the world and yourself are nothing but made-up thoughts and beliefs. You may even end up calling them lies. You might end up seeing that they had a function but that it's outlived now. There are many methods out there that can help you with this e.g. The Work by Byron Katie, The Sedona Method by Lester Levenson, the Journey by Brandon Bays or the 'Deva' method by Rachel Kaufman and Rick Phillips just to name a few. Continuously making beliefs and ego patterns conscious will get you in contact with something else. Basically with 'clutter' out of the way there will be more room for other things. You will discover that your mind will be clearer, your ability to love and connect will enhance, and your sense of freedom will be greater. 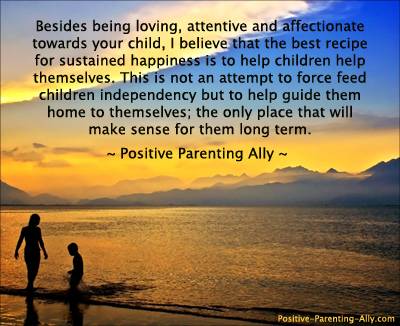 Besides being loving, attentive and affectionate towards your child, I believe that the best recipe for sustained happiness is to help children help themselves. This is not an attempt to force feed children independency but to help guide them home to themselves; the only place that will make sense for them long term. Paradoxically, my experience is that the clearer my mind is, the less I can actually say about the world. Because honestly, I don't really know much. I honestly and on a true level really don't know much about anything ... other than certain aspects of myself. Thus the only thing I can say something about for certain is my own experience. And I don't hide that. I probably say 'I don't know' to my son at least a handful of times every day. But that doesn't mean that I can't help my child. Besides tuning in, hugging and kissing and being a safe harbor, I can help my son find his own answers. I can tell him of my experience of things and he can test it out for himself. I can say I've experienced this and that and that it might be that the world is strung together in this and that way, but I really don't know. You must find your own answer, if you really feel you need one. Sometimes we don't really need an answer, and that is okay, too. Who Know Most about Living Authentically and Joyfully? As adults we tend to think (or delude ourselves into thinking) that we know more about life than children do. But is that really so? Sure, we might have experienced more, but do we actually know more about what life is about and how to live it than our children do? I would be so bold as to say no. I don't think we know more about living happily than our children. Life isn't about conceptual abstraction and boxing ideas into categories and living according to external rules and being told what is right and wrong. 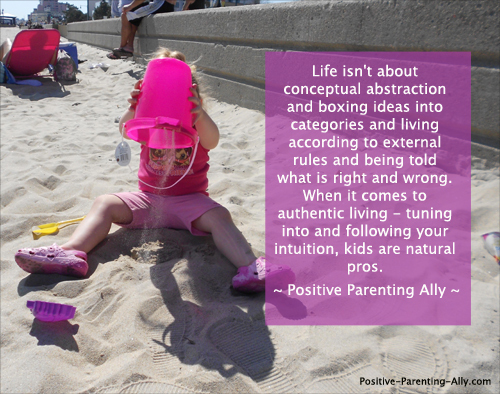 When it comes to authentic living - tuning into and following your intuition, kids are natural pros. One day I decided to really observe children when going for a walk. And I was amazed. I clearly got the impression that they still know something, which we adults tend to forget in our continuous chaos of thoughts that take us away from 'the now', the reality right in front of our nose. Also just pay attention to the way children unconditionally love their parents and wish to bond and unite to be part of a whole. They 'still' know how to be in the world in a joyful and simple manner. If that isn't clever and proof of high life intelligence, I don't know what is! Looking at your child as a complete equal or even as a teacher is the most amazing experience. Just try to look into a baby's eyes and you are taught love instantly. Who is the teacher now? So the way I see it, spiritual parenting is also about humility, stepping back and being a student of our children, ready to learn and rewire circuits in the brain if necessary. As I've mentioned already, besides providing a loving environment for my child, one of the best things I can do is to help my child help himself. Because ultimately we are the ones we are going to live with always. And what better friend to know and love than ourselves. It makes perfect sense! Thus the way that I see the best spiritual parenting skills or life tools are the ones that help our child get to know himself and his own truth. So basically what I want to pass on are tools of self investigation rather than fixed ideas of how I (or society) think my child, the world and the universe work. Oh love! The one thing that overpowers everything. The one thing in the world that I know always works and always makes sense. It's impossible to go wrong with love. In my experience love makes people grow, feel free and connected with themselves and the world. In other words, it simply makes them happy. So love is at the heart of spiritual parenting. So if love is this great, how do we work with it consciously in relation to our children? Well, first of all, I think I will distinguish between the idea of loving vs. being love as for me, there is a slight existential, intuitive difference in terms of how I feel. If I put myself in a frame of mind where I say to myself that I love my son, it feels wonderful. I feel connected and want to bond with him. However, if I imagine being love itself, there are some of same feelings but there is also more to it. There is also a powerful sense of centeredness in myself and a feeling of deep presence, being completely open and receptive to everything. Also a paradoxical feeling of both being completely 'full' and still allowing the whole world in. In relation to my son I just feel unconditional acceptance - like whatever he is now (irrelevant of his mood or what he has done) is the most wonderful thing that could ever exist. So for me being love entails an 'unconditional' aspect to being with and relating to my son. And in my experience I know nothing as healing and empowering as feeling 100% unconditionally loved and accepted; that all parts of me (even the ones I don't like) are loved. And when I feel loved, I love myself. That's the way it seems to work. And what better gift to my son (and to myself) than to love all of him, so that he can love all aspects of himself. One of the biggest objections to this aspect of spiritual parenting may be that not conveying that you have solid, bullet proof answers or ideas may leave children insecure. However, conveying a norm enhancing theory or model, saying that this is how things are to either avoid further discussion or to instill security in your child risk being counterproductive in the long term. One, your child is clever and immediately senses that you might not be sincere and two, at some point your child might discover that what you've said doesn't fit his or her reality and thus might leave him or her confused. For instance my son brings up the theme of death now and then. Death seems to scare him like it does so many people. He is afraid that I might die before him and he then wishes that when we die, we die at the same time so pain and grief will be avoided. Now, when he asks me what happens after death, I could say that we will be together again. But the truth is, I don't know, I haven't tried it yet. So what I did was to convey that I am not all-knowing but that I have faith in that life (and death) is good. Because so far my only evidence is that everything has been okay. There has been hardships but in that, if I really listened to myself, I was okay. Deep down things were okay. That is my experience. We often tend to think that we should protect our kids from the truth. I agree that some things (typically external) might be unnecessary to expose our children to but when it comes to telling our children what is going on inside us, my experience is that they can handle and understand much more than we give them credit for. For instance, sometimes I can be very tired and feel like I have a short fuse. My son may experience me as having a 'harsh voice', as he says, or that I'm 'not really listening but only pretending to'. As children mirror themselves in us and often take on the feeling we emit to be what they feel about themselves, he may end up thinking that I don't like or love him. Now the most optimal thing here would be not to behave in such a way. Obviously. It would be to show a surplus of energy and resources. But I guess we all know that sometimes that feels very difficult. We just feel tired and worn down. Being honest like this and treating small children as if they can handle the concepts of thoughts and emotions works for me and is also an important aspect of spiritual parenting in my view. First of all, my son learns about what is going on in other people, why they do what they do. Secondly, he now has a clear understanding of what may happen if he does something. You could view it as manipulation, I guess. However, I view it as honesty about how I feel right and how I predict the likelihood of the outcome of the near future if something happens. I can't know it for sure, but it's a possibility. And thirdly, he is encouraged to be open and honest too - what we do, our children tend to do. We're role models. And who wouldn't want their children opening up their inner world to us. Being allowed glimpses of their minds is such a gift. 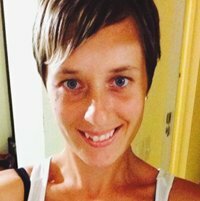 - Sowing the Seeds for Our Kids to Learn about Their Self and What It Means to Be Human: Being Conscious of Thoughts, Feelings, Intuitive Knowledge Etc. One of the things I would love for schools to have as mandatory lessons is a basic introduction in what it means to be human on a more existential level. Actually, thinking about it, it find really odd that there is no such subject in school for kids. What more essential to life than learning about the components of yourself and how your mind works? 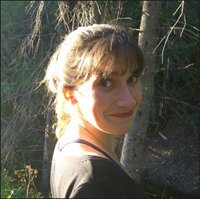 What are thoughts, what are feelings, what is intuition, what is fear, what is love etc? I mean seriously, it really doesn't get any more basic than that, does it? For instance, one day my son was angry. I can't remember specifically why but probably he had done something which he now regretted. I remember trying to make him open up to talking about it but there was reluctance. He felt that if we talked about it, it would make him feel even worse. But rather than trying to talk about the event, what happened, who said what etc. I tried to make him take a step up in abstraction by making him look at himself (he already know the concepts of thoughts and feelings, as we regularly talk about them in various situations). So I asked him, "Why are you angry, what are you telling yourself, what are your thoughts telling you?". He answers, "I don't like my thoughts. They say that I'm stupid". "Okay", I said, "My thoughts also tell me that I'm stupid now and then." He then says, "And I can't make them not do it. I can't control them." I then say, "You know what, that's a really good insight, because our thoughts do what they do. They come, they say something, they may stay for a while, and then they go again. So we can't control what thoughts come. They come, if they come. But you know what we can do? We can choose to simply view them as thoughts and that helps a lot in my experience. For instance, if you become all quiet in your head and you relax and you try to feel aaaallll the way deep down inside of you ... do you feel that the part of you deep down is stupid?" After a bit of silence, he says, "No, I don't! ", with a bit of a surprise in his voice. He then continues, "But I don't understand, why do my thoughts then say that I'm stupid?" "Well, that's the nature of thoughts. They say stuff. Sometimes they say things that make us feel good. Sometimes they say stupid things. Sometimes they tell lies. They can be tricky. They mean well, but we don't have to take them all too seriously. We can listen to what they have to say and then we decide if they do us any good. We can ask ourselves, does it feel right within ourselves?" While we were talking about this I could feel that my son was starting to relax more and actually finding the whole 'researchy' approach to himself quite interesting. Rather than being identified with his thoughts and feelings he was distancing himself by looking at himself. So rather than talking about his relationship to an event, we were talking about his relationship to himself; something which brought him back to himself and in contact with something deeper than mere thoughts. And in my experience there is nothing more healing and peace giving than getting in contact with that part of ourselves lies beneath thoughts and feelings; the Self or the inner voice. This way of looking at feelings and thoughts in order to find the peaceful truth is something American author and speaker Byron Katie has made her way of life. 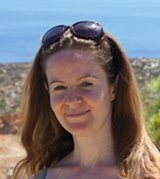 She has created a very simple method she calls The Work (which I mentioned earlier), which consists of four questions, which aims at questioning thoughts to find the truth beneath them. 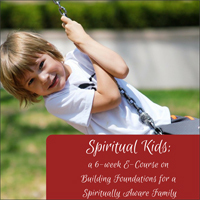 The method is aimed at adults but I find that the general idea of merely talking about thoughts and feelings and what it feels like deep inside is extremely powerful in itself at the heart of spiritual parenting. - Strengthening the Connection to the Inner Compass rather than Teaching Lots of External Rules. I have very few rules in the upbringing of my son. I'd much rather help my son develop his inner compass, his inner voice, his connection with himself - something he can then use optimally in every situation. Those rules that I do have are very concrete and often about basic survival. For instance, I could say to my son, I'd like you to cross the road at the pedestrian crossing because the cars are more alert at such places. But not even those types of rules are non-negotiable. If there is a really good argument as to why the rule is less effective or less safe than something else, it will be reconsidered. Or if there is no long-term harm done in bending a rule as an experiment, this can be tried too. For instance, if I say that he should be back a 7.30 PM the latest or he risks being tired at school the next day and he still believes he should stay out longer, I may say - for the sake of truth as I could be wrong - "Okay, we can try today and see what happens." And then the next morning when I have to wake up him for school (normally he wakes up by himself) and after school he is grumpy with a short fuse, I have some proof that being out late made him tired. And then I will bring up the subject the next day when he is well-rested again. Many places you can read that children's sense of security is elevated with the existence of many rules. Recently I read that teenagers preferred it, if there were many rules at home. This may be true for many children. I can only speak for myself and my experience of my child. And my experience is that my son doesn't seem to need that many 'external' rules for regulating his behavior. The fact that he is allowed a fairly long leash but is encouraged to go within to feel what feels good and what does not feel good, he gets an opportunity to conclude for himself about his actions and this I sincerely believe will help him fine-tune his inner compass in the long run. 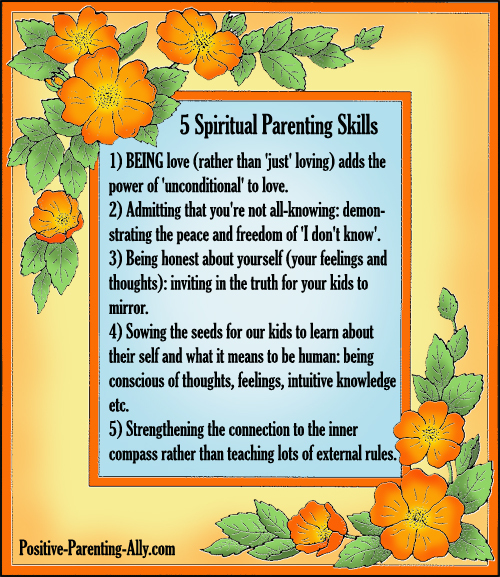 I hope you enjoyed this article on spiritual parenting, I sure enjoyed exploring the topic and writing about it. I wish you all the best on your spiritual parenting journey. 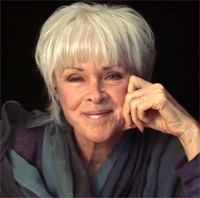 Byron Katie: A Loving, Clear and Uncompromising Reflection of Your Inner Self.